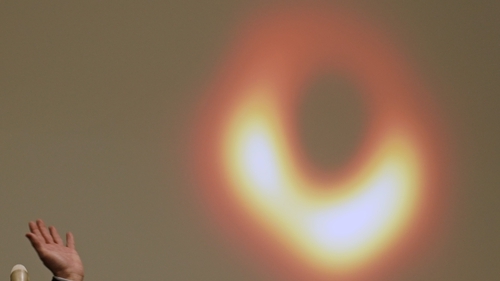 The first photograph of a black hole and its fiery halo, released today by Event Horizon Telescope astronomers, is the "most direct proof of their existence," according to one of the project's lead scientists. Frederic Gueth, deputy director of the Institute for Millimetric Radio Astronomy (IRAM) in Grenoble, France, explained the ground-breaking exploit and the science behind it. "The Event Horizon Telescope marshalled all the millimetric [radio] telescopes on the planet to make the same rigorous observations at exactly the same time. "By combining the data gathered by all the telescopes, a technique called very long baseline interferometry, we created a virtual antenna the diameter of Earth. "The millimetric range, measured in thousandths of a metre, turns out to be the best wave length to investigate black holes because the waves pass through the dust clouds that enshroud them. That is not true for infrared." What do we see in the image? "By definition, a black hole per se cannot be seen, and never will be. "But we know that the accretion disk of matter that surrounds a black hole, made up of hot gases we call plasma, along with the debris of stars torn apart by gravity, are brilliant in contrast. "As long as they have not been swallowed by the black hole, the material can be detected. The objective, then, is to visualise the black hole by contrast. "What we see in the image is the shadow of the black hole's rim, known as the event horizon, or the point of no return, set against the luminous accretion disk. "The event horizon is a bit smaller [in diameter] than the shadow. The black hole itself is within the event horizon. "Our observations revealed that the supermassive black hole in the galaxy M87 has a mass 6.5 billion times greater than the Sun, and that it turns clockwise." "Because it worked so well in 2017, when the observations were made, we are clearly going to do it again! "The EHT will continue to evolve in the coming years, notably with the addition of two new telescopes: the NOEMA telescope in the French Alps, and the Greenland Telescope. "The picture from the M87 galaxy emphatically confirms the models we have of rotating black holes. We are seeing exactly what the models predicted. That is satisfying. "The challenge now will be to measure the exact density of the matter around a black hole, and to better understand the crucial role of magnetic fields, and how matter within the accretion disk rotates."